The author, a regular contributor to Deadline Detroit, is a former reporter for The New York Times and Detroit Free Press. John Sinclair sat in a wheelchair in front of a television that showed election results. As he stared at the screen, a masseur worked over Sinclair’s frail, 77-year-old body, rubbing his arms, legs, feet, hands, shoulders and back. “Got a joint?” Sinclair asked, and, quickly, someone handed him a burning marijuana joint, which he put to his lips. Sinclair holds a card for medical marijuana, legal in the state for 10 years. Next, he had a munchie request. “Anything to eat?” Sinclair asked, and, quickly, someone handed him a small cookie, which he put in his mouth. 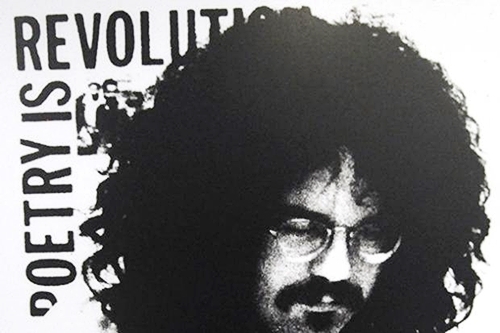 John Sinclair in an earlier era. 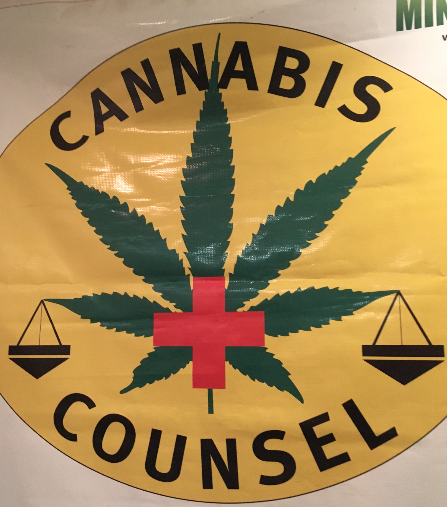 This was Tuesday night on East Jefferson near downtown in the law offices of Matthew R. Abel, “the Cannabis Counsel.” Abel and others worked to pass Michigan’s Proposal 1, which won Tuesday by a double-digit margin. It legalizes recreational marijuana in Michigan, allowing adults (age 21) to have up to 2.5 ounces of marijuana and grow up to 12 plants per household. Michigan is the 10th state to legalize pot for recreational use. Sinclair was quiet and soft-spoken for most of the night in a small group upstairs. From downstairs, a large group partied and occasional cheers could be heard when election updates were announced. Indeed, Sinclair was Michigan’s marijuana martyr, a prophet of and before his time, a celebrated and vilified advocate for cannabis. He was sentenced to up to 10 years in state prison for giving two marijuana cigarettes to two undercover Detroit cops who were out to get him. Perhaps the law-and-order communities of Detroit and Michigan in those late 1960s paid special attention to him because – along with advocating marijuana -- he was one of the founders of the White Panther Party, which vowed violent revolution in support of the Black Panthers. Sinclair also managed a legendary rock band called the MC5, the initials standing for “Motor City.” In the Baby Boom generation around Detroit, Sinclair and the MC5 were every parent’s vision of the hippie monsters from hell, via the Grande Ballroom. They also defied a police order to play for protesters at the angry Democratic National Convention in Chicago in August 1968. Sinclair’s severe imprisonment for a small amount of weed became an internationally celebrated cause. John Lennon – recently split with the Beatles – came to Ann Arbor in December 1971 to sing on Sinclair’s behalf. It wasn’t one of Lennon’s greatest hits, but made its point. In the stir for breathing air . . . They gave him 10 for two . . . While Sinclair began his sentence at Jackson, legislators softened Michigan’s marijuana laws. Sinclair got released three days after Lennon’s visit and the state Supreme Court later vacated his conviction. Sinclair mellowed out into a life of jazz and poetry and baseball, rotating through Detroit, New Orleans and Amsterdam – the one in the Netherlands, where grass has long been legal. On Monday, while Sinclair watched TV upstairs in a quiet room, a crowd of about 200 smokers swirled through the building. Although of many age groups, none of the revelers looked as old as Sinclair. Many wore cannabis-theme jewelry and clothing. Someone mentioned how confusing it now will be with neither federal, state nor local governments on the same legal page regarding marijuana. When the election result became a forgone conclusion, one casually dressed man popped a champagne cork and poured out glasses of the legal but well-regulated and well-taxed alcoholic mood enhancer. ♦ Related post: Now That Voters Say Yes, When Will Recreational Pot Be Legal? In another room, a stylishly suited man sat next to a well-dressed woman. He emptied a bag of green buds onto a cardboard sign urging legal marijuana and constructed a ”party cone” joint that contained, he said, one-half ounce of marijuana. The couple then took the party favor to one of the crowded rooms to share with others. But they couldn’t share it with Sinclair, who was no longer there. He’d departed early because he felt fatigued and needed to get back to the rehabilitation center. He’s stayed there since leaving the hospital after his accident in early October. But he said he is optimistic about soon returning to his place near Little Caesars Arena. And he wants to fully recover in time to attend Tigers games in the spring. Someone took Sinclair’s black jacket off the back of his wheelchair and helped put it on him on this blustery, mid-autumn night. The back of the jacket showed the words “Kick Out the Jams,” the title of the MC5’s signature song. As Sinclair started to leave, a few people recognized him and greeted him warmly. But others were unaware of the thin man with the wispy white hair and the long, pointed, gray beard. The younger people in the crowd only glanced as he was wheeled out. Sinclair, vindicated after half a century, left in a good mood.